Winter is a tricky time of year for me. On one hand, I love it; I love the crispness of the air, I love the prospect of snow and, of course, I love Christmas (duh). But there's another part of me that really struggles with the winter time, namely, my skin. Up until the last couple of years I never had a problem with my skin during the colder months, but recently my skin has hated it with a burning passion - and my skincare routine just hasn't been cutting it. This year my skin feels so dry and lackluster, and I've found that taking my makeup off with makeup wipes has only made it worse. SO I've decided to convert to a makeup remover balm and it's one of the best decisions I've ever made. The shining star I'm talking about? Clinique Take The Day Off Balm, of course! I've had this wonder balm for quite a few months now, however I have to say it's been pretty neglected up until late. I'm sure we can all agree that makeup wipes are so easy, especially at the end of a long day where all you want to do is go to sleep! And fussing about with a balm just isn't appealing - trust me I know! But I've honestly been astounded by this particular product; the consistency is pretty thick at first, but it melts into the skin so easily whilst feeling extremely nourishing, you can also see it physically removing your makeup with so much ease, leaving the skin looking fresh and clean. I much prefer cleansing balms to cleansing oils as I feel that oils tend to leave a greasy film on my face, which in theory should be hydrating for the skin, but it just leaves mine feeling gross, personally. I've been using the balm in conjunction with my Vanity Planet ultimate skin spa system, which is a rotating spa brush (see an in depth review here!) and makeup removal has become completely effortless. 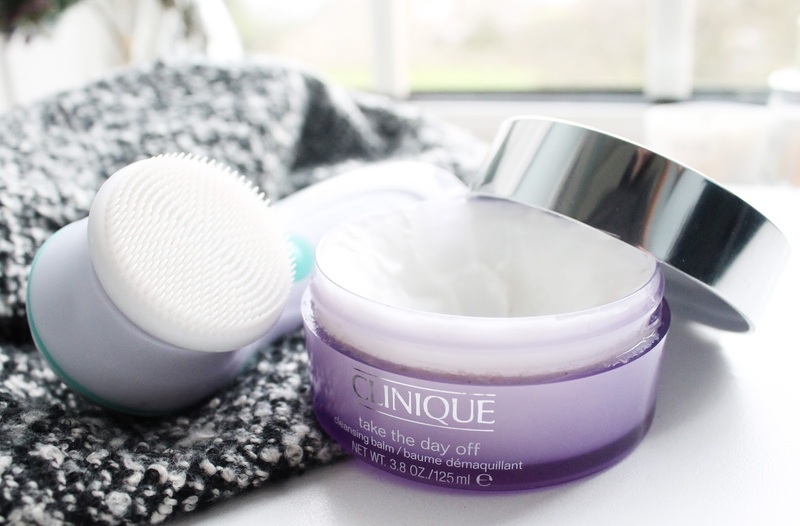 I firstly work the clinique balm into my skin using my finger tips, I then proceed to use the spa brush for an extra cleanse. Since introducing this makeup removal method into my routine, my skin feels much less dry, more hydrated and looks visibly clearer! These are two of my skincare staples - What are yours? This product sounds like a lifesaver. I have used make up wipes so far (but guilty of sleeping with make up sometimes- ops!) and I was thinking to try Micellar Water to see how it goes. You should definitely try a balm, they're so great at makeup removal! I have the Emma Hardie cleansing balm! I absoloutley love it but I got it on sale for £25 and don't think I'd pay the £38 for it! This seems like a great alternative! It's so good right! Same here, I can't justify the price when there's equivalent products for a cheaper price - such as this balm! Sounds like I should try these two out! I love this balm especially, I've also been loving the Emma Hardie balm. I think it's just a great step to introduce during the colder, dry-skin so to speak, seasons! cleansing balms and oils are my fave and this sounds so good. i love clinique skin care and i'll try this one for sure. Love cleansing balms did not know Clinique had one! Quite a few people haven't heard of this one - definitely a must have! They leave my skin feeling so dry :( You should definitely try it sweet! I love baby lotion - it's so underrated! I worked for Clinique for half a year and this stuff really is BOMB. I love the tissue off and the normal remover as well, all so great. Beautiful pictures on your blog, too! I could scroll forever. I'm not a fan of makeup wipes, my skin just never feels clean after. I usually find myself opting for the Botanics Face Balm. It is very nourishing and concentrated so you don't need much. Perfect for dry winters skin. That sounds great - I'll add it to my wishlist! I love this balm! It's so good at removing makeup and I love the fact that it's fragrance-free. I love using oils to take off my makeup, but I also don't like the greasy residue which is why I always double cleanse- first with oil then I follow up with a gentle cleanser. I love the fragrance free aspect too! As a girl with dry and sensitive skin, fragranced products can really mess with my skin but I've had nothing but great results from this! I really want to try this! I love their Take The Day Off eye makeup remover and this sounds just as good! I never thought a balm would become w make up remover ever but this sounds like something I must try out! My current skincare staples are Simple Hydrating Light Moisturiser and Exfoliating Wash!